Description: This in-flight view of NASA's two-seat F-16XL #2 research aircraft clearly shows that the left and right wings are definitely not mirror images of each other. 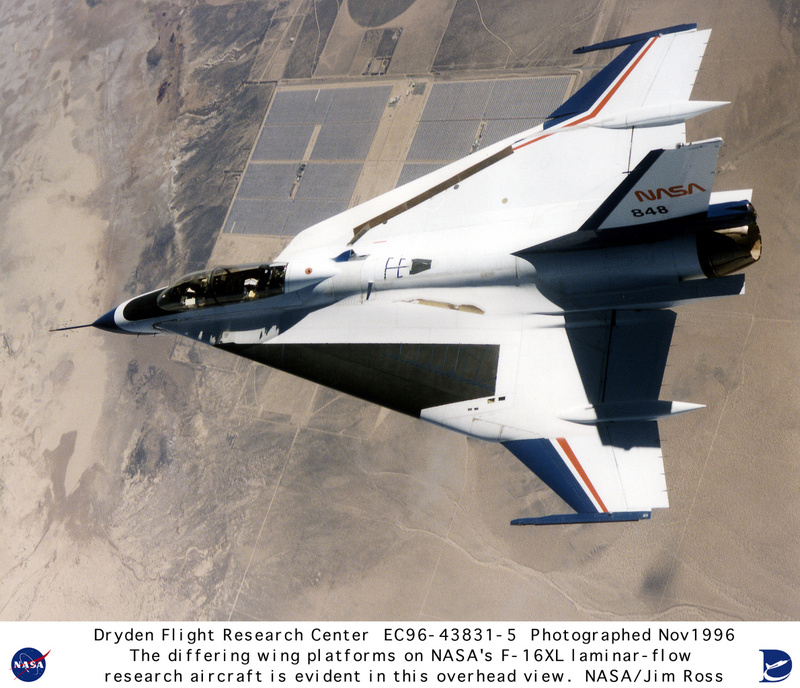 Nevertheless, pilots who have flown the highly modified aircraft at NASA's Dryden Flight Research Center, Edwards, California, state that the asymmetry created by modifications to its left wing for the Supersonic Laminar Flow Control (SLFC) project was easily handled by the "XL's" flight controls, and that the plane handled well. The unique aircraft flew 45 research missions over a 13-month period in the SLFC program which ended in November of 1996. The project demonstrated that laminar -- or smooth -- airflow could be achieved over a major portion of a wing at supersonic speeds by use of a suction system. The system drew a small part of the boundary-layer air through millions of tiny laser-drilled holes in a titanium "glove" fitted to the upper left wing.